Of course it always starts with a dream. Don't all ridiculous notions usually do? So there i was in my dream, dressed in skin tight leather and spanx and whatever else Milla jovovich sexed up in Resident Evil (yes! In my DREAM i had a figure like hers as well!). I was battling zombie dogs left, right and centre, romancing the handsome hero, chopping zombie heads like a whirring dervish and well...basically saving the cosmos from annihilation. I even had a line when i chopped up the myriad of walking dead and it goes "awww cutie!" At the time i thought it was cool ok. And further in my defence i was alseep and had no control over my dreams! Then i woke up. Reality sucked a bit and i wanted to revel in the glory of my tight fitting black spanx and proceeded to (unfortunately) tell my sister and brother the amazing dream i had smothered in daredevil decadence. I ended the tale with "aww cutie" line and paused smiling super proud waiting for my brother and sister to respond. My brother and sister, nasty imps that they were gawped at me in utter disbelief, then they looked a each other and fell onto the floor, rolling with laughter and clutching their sides for dear life! Questions ranging from "why can't i save the world from a zombie army?" To "i won't look that bad im black spanx" poured out from me. The twins guffawed even louder and my brother said ever so matter of fact "See, if a zombie apocalypse does happen, you would be the first one to be eaten!" This incident happened about the time resident evil 1 released in India. Even today, in the year of 2015, these twin zombies eat me alive with constant references to my "awwc cutie" line and leather and spanx filled secret fantasy! So anyway, apart from the humiliation, i did think about where i would be and what i would do during an apocalypse of the zombie kind (i am obsessed about it...so there!) After a lot deliberation i finally arrived at the hurtful truth. My brother was right! I would be if not the first, atleast one of the firsts to be chewed up! And why you ask? This 1st point takes me back to the time i tried my hand at sports. My family has sports in their blood and i thought maybe some of it trickled into me as well. It was pure shock that made the sports teacher endure my antics for a bit. Then he begged me to go back to my reading and writing. Fine! I cannot run people! Infact my toddler runs faster than i do! All i ever see in zombie movies are people running like professional sprinters and i know for a fact that i almos wheezed to death after 2 minutes and i mean TWO MINUTES of an early morning jog with my sister! I would not be allowed to tag along with any of the survivor groups because i would do nothing except slow them down and so the only way i can escape is if the zombies take pity on my miserable athletic ability and say they would come back for me later. I would still be hanging around gasping for breath by the time they trudge back anyway! 2) "I don't know directions"
Imagine a survivor group takes me in and we find a big car in perfect running condition with a full tank of gas and because everyone has sustained injuries saving me from every imaginable danger possible because refer point 1, i am picked to be the driver. I can drive thank god but i can't even begin to tell you how bad i am with directions. I think that line about women not knowing left from right was written all about me. 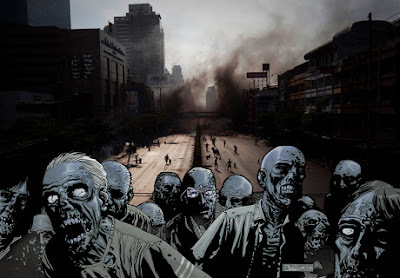 If you are a survivor and you are in a car with me as the driver, rest assured i would drive you straight into the nearest dead end/ hanging cliff/ burnt down bridge or best of all, the hungry zombie horde! So i don't care if your arm is falling off, if you want the rest of you to be intact, take the wheel son, take the wheel i beg of you!! One fine day when i was a kiddo, my parents bought me a box of chocolates and asked me to eat ONE a day (parents have an inbuilt torture mechanism!). I would have one after lunch and till i closed my eyes to sleep i would feverishly think about that holy box that i was not allowed to touch until the next afternoon! It was masochism at it's finest i tell you! One evening my parents when out, something in me snapped and i ate HALF THE BOX and went into a chocolate coma! Furious is a trivial word to use to describe my parent's state when they returned. Which brings me to my 3rd point. If i don't die because a zombie chomped on me, i would probably die of starvation. I would happily gobble up my food ration that was to last months in a matter of days and spend the rest of my miserable starving days drooling over the rest of the group's rations. Eventually sick of my staring face, they might juat throw we to the zombies! 4) "I am clumsy as heck!" Suppose there is a room that is a acre big, it's just me in the room with a lamp in the furthest corner for company. Despite the enormous space between the lamp and me, somehow i would end up breaking it. Yep, i am that clumsy. No group with me in it would live to tell how the apocalypse ends for sure. We might be sneaking through a house to get to the rescue car/copter/ship/train/cycle rickshaw just on the other side. I would end up breaking so many pots, upending so many chairs, smashing into so many tables and overall making so much,the zombies would pretty much hire me to become their tracker, encourage me to join groups and make enough noise (not that i need coaxing for that!) So that they can find the survivors without breaking into a zombie sweat! Neat huh? NOT! 5) "I have the least survival mode"
If i am hungry, stinky and tired you might as well chuck yourself at the nearest zombie because that would be a treat compared to all the cribbing, negativity and moaning that would ensue from me! When i look at survivors in movies all i try to figure out is the last time they brushed their teeth or washed their pits. I would go nuts if i had to face months of no shower or decent sleep or warm meals trying to escape a murderous zombie horde! And i would drive everyone in the group nuts as well with my constant whining and my fate would more or less be similar to point no.3. Now run along and apply these 5 points to yourself and think; would you survive a zombie apocalyse? I'd like to know! I loved this post. It was very well written and it was attention grabber actually. You should write more posts like these. These were amazing. Thank you so much.